Boys Life Magazine Cover 1929. 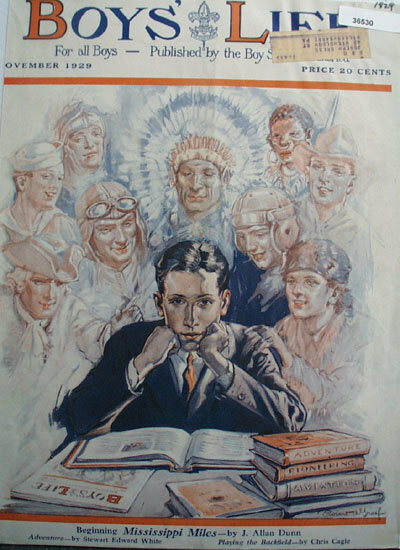 This color November, 1929 Boys life magazine cover published by Boy Scout of America shows boy setting at desk with Boys life magazine and adventure books. He is day dreaming about all the people he is reading about. Also states beginning Mississippi Miles by J. Allan Dunn. adventure by Stewart Edward White and Playing the Backfield by Chris Cagle. Magazine tear sheet picture is taken through plastic and may show wrinkles or crookedness that is not in the ad. This Original magazine tear sheet measures 10 inches wide by 13 3/4 inches tall. Items Similar To "Boys Life Magazine Cover 1929"